↑ ୧.୦ ୧.୧ "Gujarat Budget Analysis 2018–19" (PDF). PRS Legislative Research. Retrieved 19 November 2017. ↑ ୨.୦ ୨.୧ "STATE WISE DATA" (PDF). esopb.gov.in. Economic and Statistical Organization, Government of Punjab. Retrieved 17 February 2017. ↑ ୩.୦ ୩.୧ ୩.୨ "50th Report of the Commissioner for Linguistic Minorities in India" (PDF). 16 July 2014. p. 118. Archived from the original (PDF) on 8 July 2016. Retrieved 6 November 2016. ↑ Benedikter, Thomas (2009). Language Policy and Linguistic Minorities in India: An Appraisal of the Linguistic Rights of Minorities in India. LIT Verlag Münster. p. 89. ISBN 978-3-643-10231-7. ↑ "Sub-national HDI - Area Database". Global Data Lab (in ଇଂରାଜୀ). Institute for Management Research, Radboud University. Retrieved 25 September 2018. ↑ ୬.୦ ୬.୧ "Census 2011 (Final Data) - Demographic details, Literate Population (Total, Rural & Urban)" (PDF). planningcommission.gov.in. Planning Commission, Government of India. Retrieved 3 October 2018. ↑ ୭.୦ ୭.୧ ୭.୨ ୭.୩ ୭.୪ "Gujarat forgets state bird, tree and flower". The Times of India. 14 January 2016. Retrieved 14 July 2017. 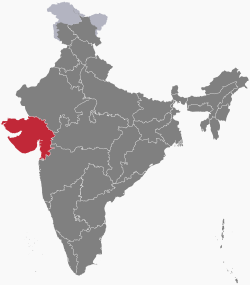 ↑ "Newest version of Jay Jay Garvi Gujarat song launched(Video)". DeshGujarat. 2011-05-07. Retrieved 2016-11-12. ↑ "Which is State Fruit of Gujarat India – Mango (Keri)". Nri Gujarati News. Retrieved 14 July 2017. "INTER-STATE COUNCIL SECRETARIAT, Ministry of Home Affairs". Retrieved 13 February 2018. "West Zone Cultural Centre". wzccindia.com. Ministry of Culture, Government of India. Retrieved 13 February 2018. "Geological Survey of India". Retrieved 13 February 2018. ↑ "History of Gujarat". Official Portal of the Gujarat Government. ↑ "Gujarat Population 2018". worldpopulationreview.com. Retrieved 2018-01-24.